The other developer already owns a shopping mall called Lanterna that specializes in furniture and interior design just opposite to the proposed development’s site. I hear the numbers of shoppers visiting Lanterna have lately showed a decreasing trend, so I suppose this new project is strongly linked to wishes of attracting more customers to the area. From bus parking lot to megastores, is the plan. Business people naturally always have euro signs in their eyes, but city administrators and decision-makers share the enthusiasm, too. The project’s planning documents stress three key arguments in favor of the new shopping complex: 1) it has a good location with respect to adjacent residential neighborhoods; 2) the area is well-connected by public transport and car; and 3) the project is in line with the city’s strategy to develop East Helsinki as an employment area. Lanterna mall is next door to the planned development. Even if their door is almost 250 meters away from where I’m standing. The Finnish obsession to build malls is a topic I like to write and talk about. Not because it’s a good thing, but because malls generate a destructive blast radius denying attempts to create vibrant urban streets and neighborhoods anywhere near them. Malls and similar structures tend to concentrate and enclose city functions indoors. Also, the sad reality overshadowing Helsinki’s urban planning is that enthusiastic talk about getting serious with curbing sprawl and introducing truly urban development patterns is far from what’s actually happening on the ground. The city still very much favors car-centric low-density projects in its planning practice. So what’s going on in Roihupelto isn’t really all that surprising. The first two pro-mall arguments underline my view that decisions don’t get made with 21st-century urbanism in mind. 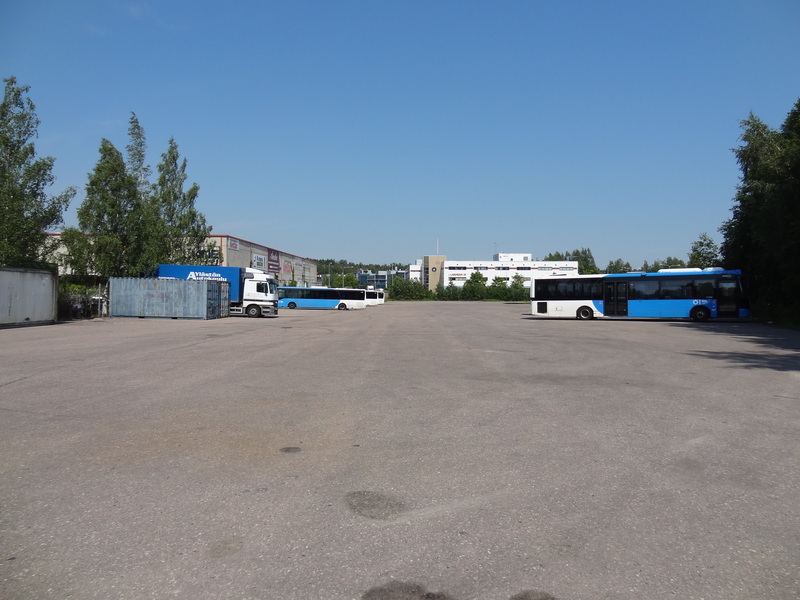 Roihupelto’s closeness to residential areas is certainly a matter of perspective because – as so typical to Finnish planning – Roihupelto has been zoned strictly for industrial and business uses. Its area is just a bit smaller than one square kilometer and it contains slightly less than 4000 jobs and less than 20 residents. Moreover, the same pattern continues southwest towards Herttoniemi where the business zone holds more than 5000 jobs compared to about 50 residents in an area of approximately one square kilometer. Simply put, when you are in either area, there isn’t a residential building in sight. 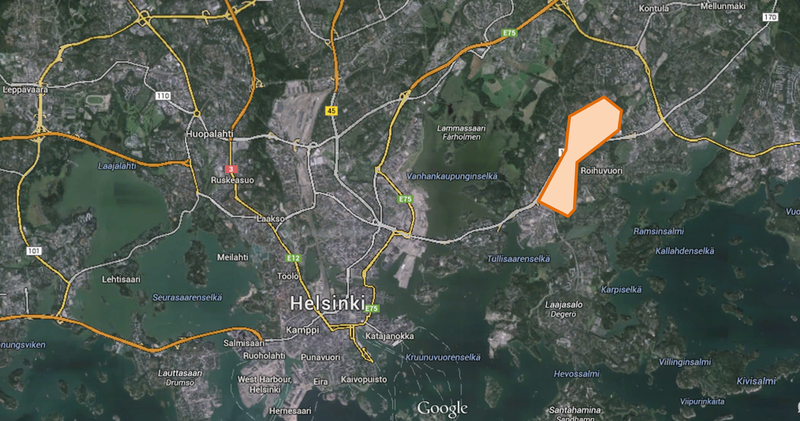 The Roihupelto and Herttoniemi business-only areas create a huge housing desert not far from downtown Helsinki. Map source: Google Maps. And as always in cities with patterns of highly separated land uses, distances grow big. For Roihupelto this means easy access by car as the area is located right next to a six-lane urban highway which has been built to connect different parts of East Helsinki. It also means terrible public transport connections for Helsinki standards. Roihupelto falls just in the middle ground between Siilitie and Itäkeskus Metro stations. From either station you need to walk a minimum of 10 to 15 minutes to get to the edge of the area. Two bus lines service the area, but they are ultimately designed to add east-west connections between neighborhoods with low connectivity levels. In essence, the buses offer slow direct connections to other places characterized by sub-standard transport services. Roihupelto definitely is not a place I would promote as being “well-connected”. The future may fortunately be brighter because Helsinki’s got plans on the table to install a high-speed tram connection through the area and/or to add a new Metro station for Roihupelto. With that being said, it makes little sense in my opinion to keep developing the area as a mono-functional zone because these future transport improvements will increase pressure to zone in some housing, too. But what I mainly want to focus on is the city’s third argument claiming that the shopping complex project is in line with developing East Helsinki as an employment area. All in all, East Helsinki is home to about a quarter of the city’s population, but less than 10% of its jobs. The project proposal promises that “Motonet alone will bring 50 new jobs”, which intuitively does make a case for supporting such actions. Adding new jobs means removing old jobs. The building soon to get retrofitted into retail space. A topic for discussion on its own is the odd fact that part of the project is indeed to transform an existing industrial building already full of jobs into shop space, but I want to concentrate on an interesting perspective to evaluate urban development in cities I recently came across in Charles Montgomery’s book Happy City. In his book, Montgomery refers to a spatial systems approach used by Joe Minicozzi and Public Interest Projects to illustrate decision-makers in Asheville, North Carolina what jobs and tax revenue benefits revitalizing the city’s downtown can bring about. A spatial systems approach simply means looking at how productive a given piece of land is, just as farmers do when raising crops. Like Helsinki’s decision-makers do now with the Roihupelto development, most people agree that urban projects which increase employment and tax revenue are good for cities. The positive impact for the local economy often also overrides concerns over the nature of the development. Big box stores and malls in the middle of nowhere are suddenly not that big of an eyesore or sprawl catalyst when they bring jobs. Montgomery exemplifies that such discussions often arise when for instance Walmart proposes new megastores to the edges of communities in North America. That’s something not unheard of here in Finland either. Ideapark Lempäälä, 12km south of Tampere. The mall premises consume 30 hectares of land including surface parking for 4000 cars. Picture courtesy of Miikael Hellman/Wikimedia Commons. 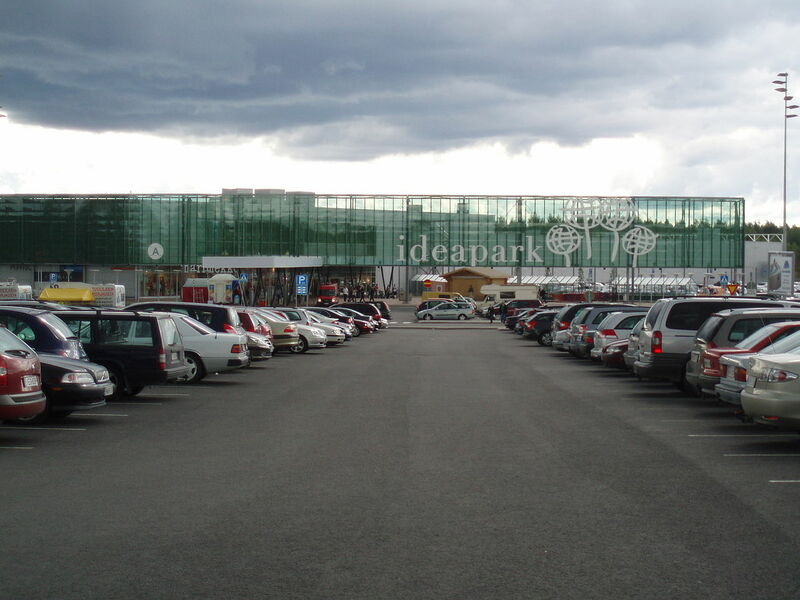 Many might for example remember business person Toivo Sukari’s visions to build new Ideapark shopping malls outside cities all around Finland after the completion of his first project to the south of Tampere. 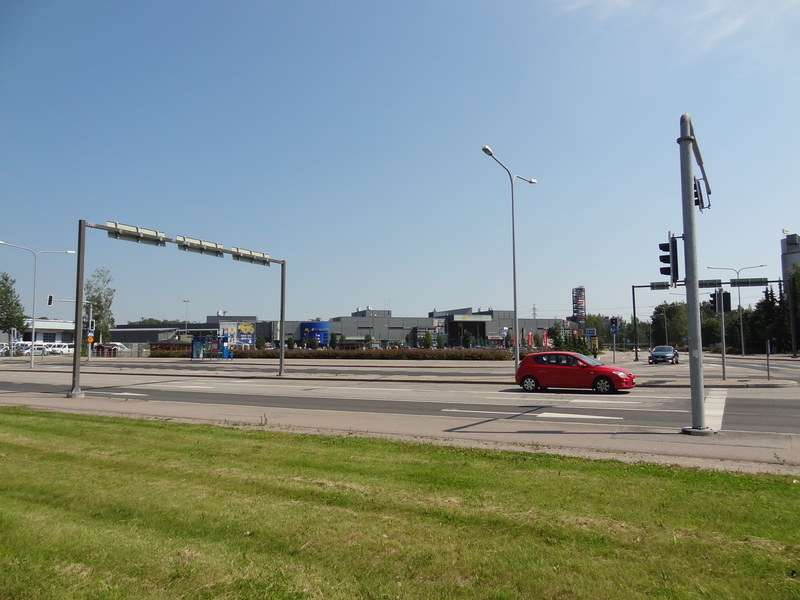 Sukari’s 15-hectare mall at the edge of Helsinki’s metropolitan area in Vihti was for instance supposed to directly add 1500 new jobs to the area. This and other similar Ideapark plans were however eventually shot down by the national government because of their obscene linkage to promoting car-centric lifestyles and urban development patterns. Experiencing the spatial reality of the Tampere area Ideapark mall may just have given government officials a wake-up call to step up before it’s too late. News has it that Sukari is nonetheless still in business, although he has needed to downscale his mall concept. His next mall will open later on this year in Oulu. 1500 new jobs is of course a major employment boost and there definitely is nothing to criticize about the intention in itself. But if we consider the relationship jobs have to land consumption, distance, scale, and cash flow, enormous mall and megastore projects become very controversial. 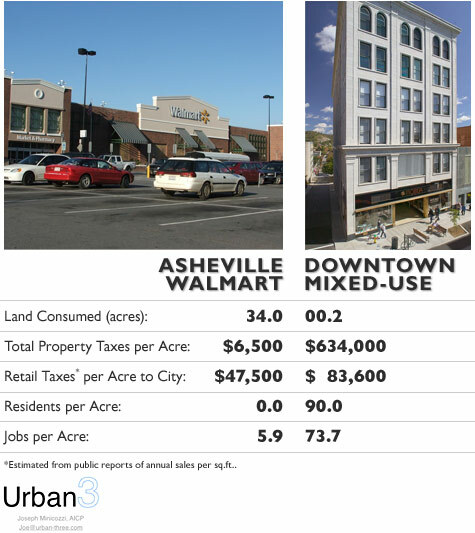 Joe Minicozzi’s Asheville comparison of a big box store and a downtown mixed-use building. Image source: Planetizen. Let’s see how this perspective plays out for Helsinki. 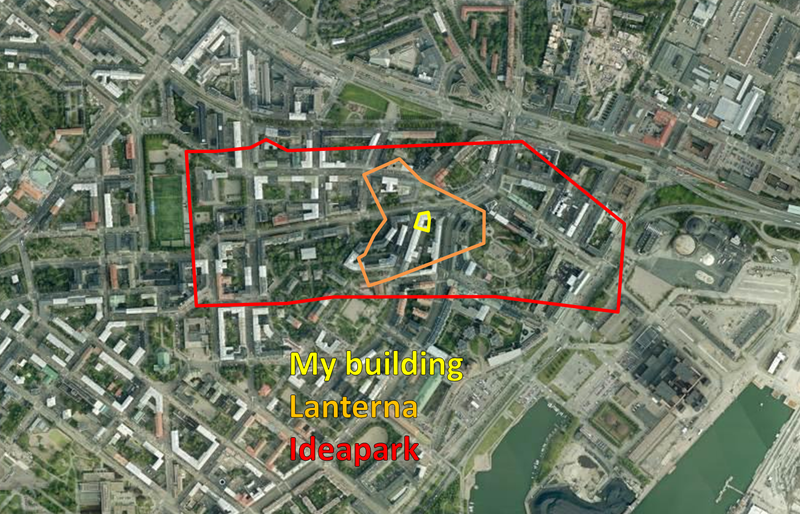 I’ll compare the building I live in Helsinki as an example of the dense urban context and the Lanterna mall in Roihupelto as the example from sprawl city, mostly because I don’t have the total employment projections for the proposed shopping complex. But the mall next door is in any case very comparable. Lanterna eats up a decent amount of land. To smoothen the horrible cityscape, either they or the city has installed a lawn and plantings at the edge of the mall parking lot. Adorable. Lanterna mall covers a total area of 4.6 hectares including its sizey parking lot. According to my inquiries the two-story mall is estimated to employ about 100 to 145 people. So let’s say 125 as an informed estimate. These numbers mean that Lanterna’s model of land usage gives us about 27 jobs per hectare. 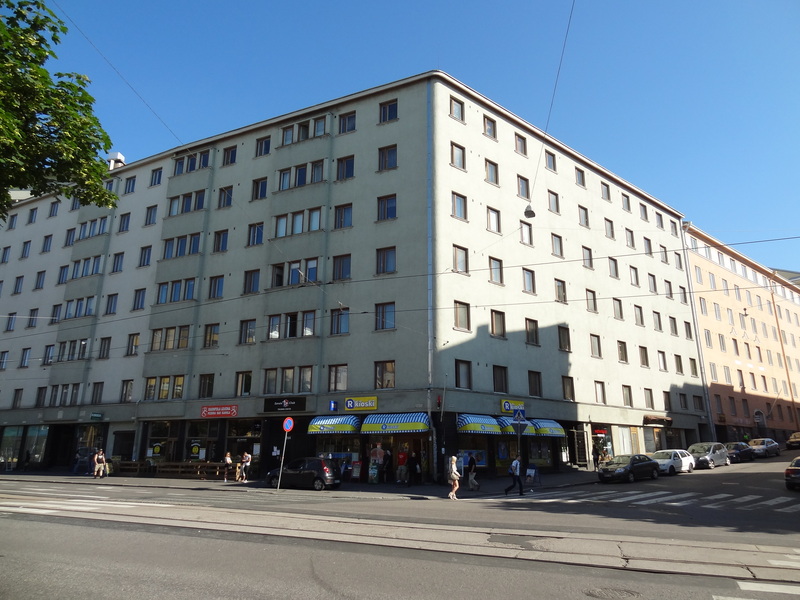 My building in the inner city of Helsinki on the other hand is an early 20th-century mixed-use building with apartments over six business spaces. The building sits on a 0.11-hectare lot and is home to 103 people. According to my investigations, the building’s business spaces employ roughly 18 people. On top of that, there may be self-employed people among the residents that mostly work from home – like me. But as the numbers are not precise, let’s keep it at that 18. It’s more than enough to make my point. My building in Helsinki’s Kallio area. 18 may not look like much compared to Lanterna’s 125, but when you take land consumption into account, the numbers turn around drastically. The development pattern my building represents translates to 167 jobs per hectare AND 956 residents per hectare. In comparison to Lanterna, the mall development thus consumes 43 times more land while it produces six times fewer jobs per hectare. And of course, offers housing for 0 residents. Helsinki’s development patterns in comparison. Note that I’m using hectares instead of acres. N.B. Table edited on June 14;mixed-use jobs number corrected. Joe Minicozzi also added tax revenue to the mix in his research by considering sales and real property tax gains between the two development models. As already mentioned, his findings were that examples from the dense urban context were significantly more lucrative for the city. In Finland we have national value-added tax instead of local sales tax and our municipality-based real property tax system is so complex that I have neither desire nor know-how to evaluate its impact very deeply. But I did consult people from the tax administration office. The general message I received was that the obvious assumption of having more development on a given piece of land leads to more real property tax gains holds truth to it. In a theoretical example of a similar set up that I discussed with them, new development in the dense urban context brought 30% more income to the city per hectare in real property tax revenue. This of course is far from any rule of thumb, but the bottom line is that economic considerations from this perspective should not be out of the picture here in Finland. And if this wasn’t enough, Montgomery and Minicozzi add two additional notes. 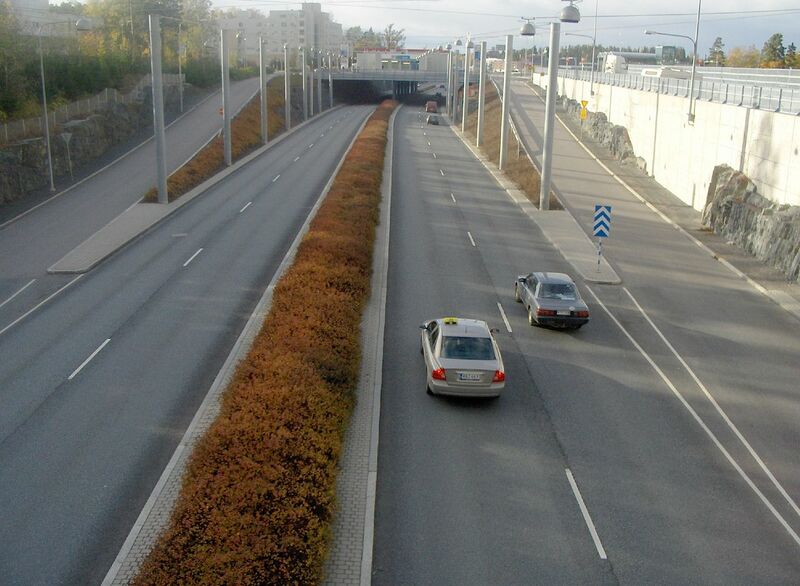 Road infrastructure investments in East Helsinki. Picture source: Wikimedia Commons. Secondly, Minicozzi’s examples suggest that benefits from the denser development model become even clearer when considering that consumption is more likely done in local businesses in that setting. This means that more money tends to stay in the community, which in turn produces more local jobs. Money spent in big national or international chains on the other hand flows out of the local economy. My Helsinki example supports this view. Lanterna mall houses national furniture chains and only one independent shop run by its owner. 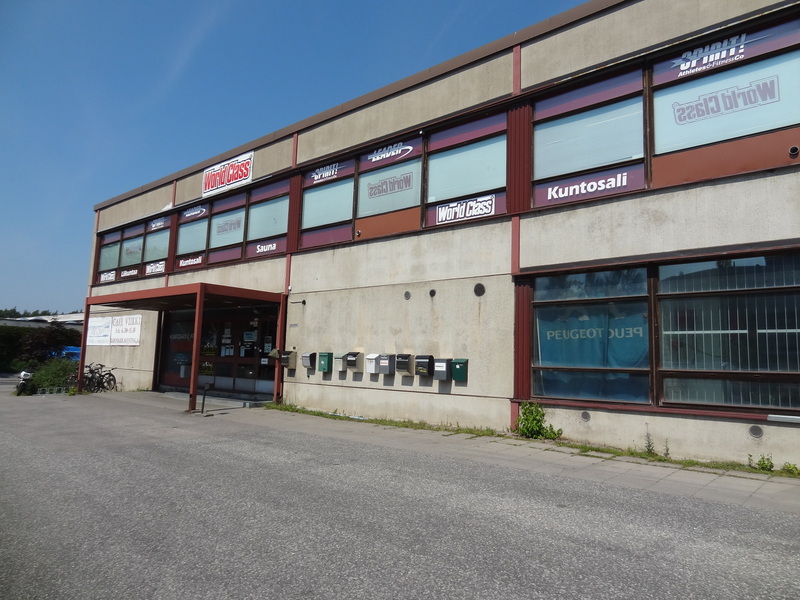 Conversely, the businesses in my building are all independent apart from an R-Kioski convenience store outlet on the corner that’s currently part of a Norway-owned big chain. The rest comprises of a restaurant, a barber shop, a picture agency, and a sports club. One business space is in the process of getting a new tenant. What I especially find positive is that the barber shop and restaurant are owned and run by immigrants. To get a better picture about Helsinki’s development in this sense, I also talked to an independent shopkeeper who has her small store in a suburban mall. She told me that entrepreneurs essentially have very much the same concerns as people entering Helsinki’s housing market: rents in the inner city are high which causes businesses to move to the suburbs. Just like many residents get pushed to the suburbs as ever-increasing demand also prices many out from the inner city’s housing market. In her case, the rent in the mall she works in is four times less compared to her earlier business location in the heart of Helsinki for a shop space of the same size. 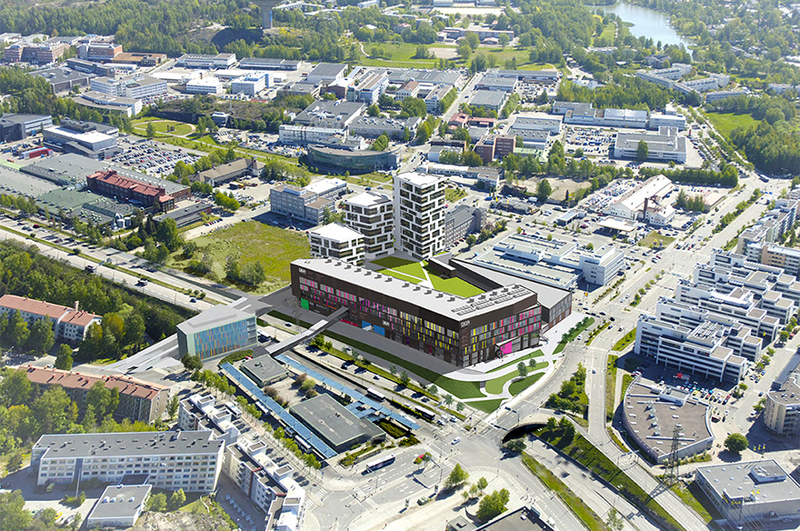 Gigahertsi mall in Herttoniemi is estimated to open in 2015. Yes, believe or not, another mall. Image source: gigahertsi.fi. Doing business in malls could however be better, too. She contests the condition that basically every single mall in the city and across the country houses the same chains: “they are as if each other’s clones”. Malls are also run by gigantic and faceless national or global investors that don’t care too much about the day-to-day life inside (or outside) their premises. But shopkeepers are stuck with trying to locate into malls and shopping centers because there really are no options to take your business elsewhere in the suburbs. She hopes that the future will bring development proposals that offer reasonably-priced possibilities for independent entrepreneurs to do their own thing. That would be in line with the national government’s desire to encourage people into entrepreneurship to employ themselves and it would offer choices for consumers, she told me. Land consumption compared. Malls and dense mixed-use development don’t blend together well. Ideapark Lempäälä would cover a sizable part of my neighborhood. Map source: Fonecta. All in all, compact mixed-use development definitely has much more potential to generate jobs than the mall pattern. Especially in the retail and services sector. Added benefits are people (retailers, read customers), higher tax revenue, smaller infrastructure costs, and more options for entrepreneurs as well as consumers to choose what suits them best. Simply, denser urban development patterns have enormous potential to create value for cities. 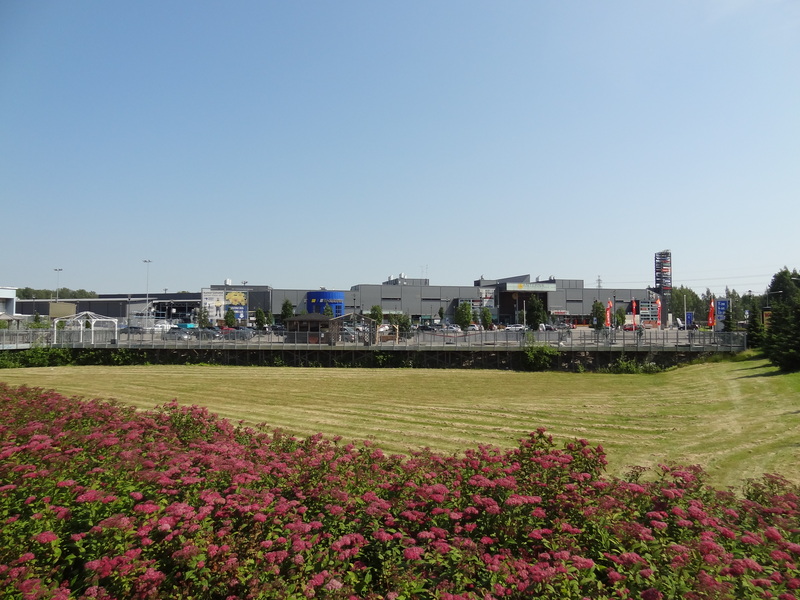 I don’t know about you, but to me the proposal to build more mall-like megastores in Roihupelto sounds like the exact opposite that Helsinki should be doing. Montgomery, Charles (2013). Happy City. Transforming Our Lives Through Urban Design. 355 p. Farrar, Straus, and Giroux, New York. Previous PostTampere’s Aimless Urban Strategy of Planning for Cars and PeopleNext PostCan SoftGIS Tools Help Us Rediscover the “Human Element” for Shaping Livable High Density Urban Neighborhoods? Nice to see that you got your inspiration from Happy city, the book is stunning. 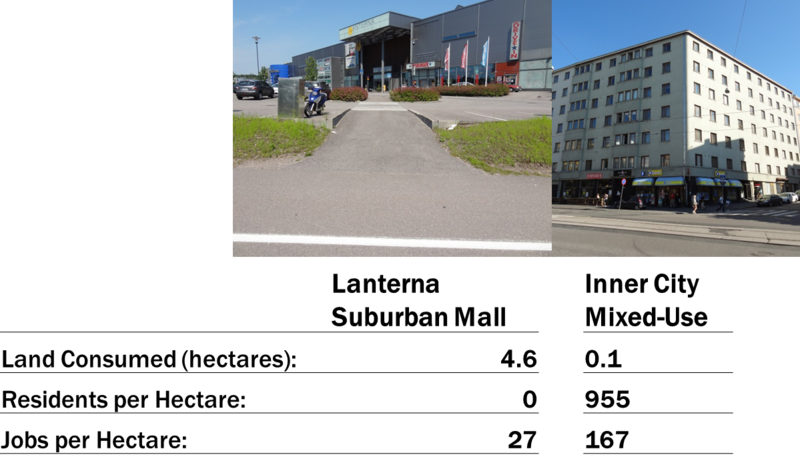 You’ve written an excellent article about this one example in Helsinki, but world wide cities keep making the same mistake by preferring big suburban malls over investing in mixed high density neighbourhoods. Decision makers wake up, it’s time for a new strategy. Thanks Tim! It was you who told me to read it. An excellent tip indeed! Your post is an interesting read for someone like me who is not involved with city spatial needs (just stumbled on your blog). The main thing I do not like about malls/big box stores is the death of local and independent business. There may be perceived advantages for malls e.g. convenience and lower prices, but what happens to variety of products, and ethical treatment of suppliers who deal with the chain stores located in the malls or the big-box stores? They are forced to supply goods at very low prices. Not good or ethical at all! Great article, thank you for summing up the issue as relatable as you did with all the photos and maps! I actually found your blog while researching urban planning in Helsinki and immediately thought: yes, he also read Happy City! That book changed my way of looking at our urban fabric. I really do hope that there are some positive changes happening now in Helsinki!